Faced with the speed of change, which means we risk losing our heritage connected with the activities of the world of work, an important opportunity for protecting and exploiting this specific segment of the collective memory has been given by the setting up of an archive at the Ansaldo Foundation containing oral sources from the world of labour and enterprise. 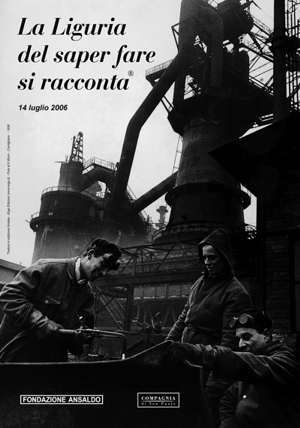 Compared to similar experiences already begun in Italy and other European countries, this initiative originally differed both in its specific attention to the world of labour and enterprise, and for the scientific and administrative integration between the oral sources collected and the paper, photographic and film documentation held by the Ansaldo Foundation. The Oral Sources Section, open to consultation by academics, is therefore configured as a stable piece of cultural infrastructure with the mission of continuing in the systematic collection of oral accounts and cataloguing the accounts already taken by academics, institutions and other parties but threatened with loss or destruction. This initiative falls under the sector of cultural assets. Accounts and evidence of the world of business and enterprise are indeed not limited to company, technical and administrative documents but also include photographs, films, systems and above all the experiences of the key players and their collaborators. This is a collection of material signs and values representing fully fledged cultural assets both in terms of the ability to directly express ethical and aesthetic values and for their usefulness in the social development of knowledge.